Is there a nursery? Can I bring my baby into the worship service? If you’re more comfortable having your child with you during worship, then that’s what makes us happy. 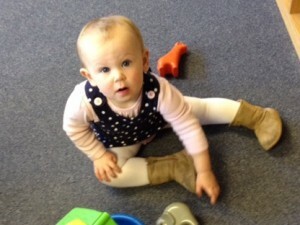 If you prefer, children up to age 3 can be dropped off in the nursery/WeeJam located right behind the sanctuary. 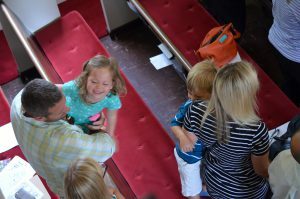 Our Pastor invites all the children (the nursery caregivers even bring the youngest in) for a Children’s Message during worship. You never know what’s going to happen; this time is a highlight of the service! The kids usually get a treat following the Children’s message. All children are welcome and invited to participate in communion when it is served on the 1st Sunday of the month as well as other special occasions. Check out GETTING CONNECTED for specifics. 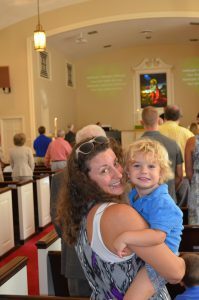 Worship on Sundays at 10:30 a.m.